The complex offers a traditional Moorish flavour with little whitewashed apartments and fantastic views of the Mediterranean and mountains. 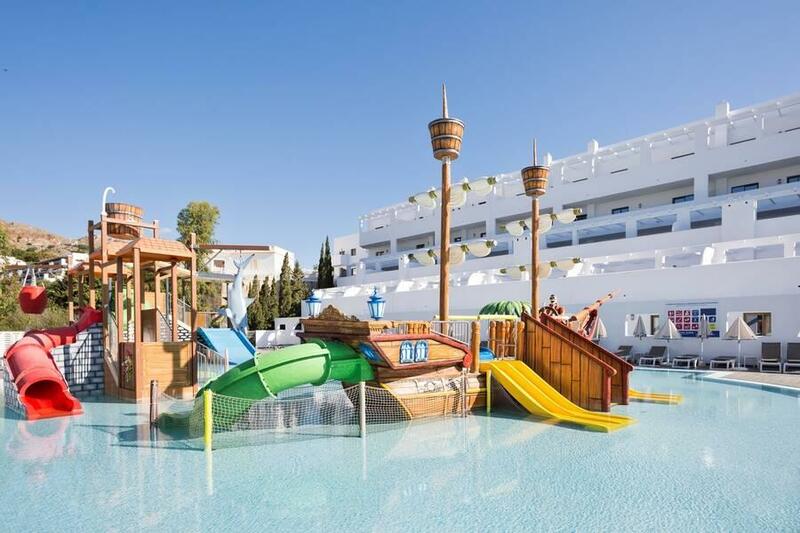 Facilities include a large outdoor swimming pool with childrens section and spacious sun-terrace and garden areas furnished with loungers and umbrellas. Leisure facilities include a kids club, childrens playground, daytime and evening entertainment for adults and children. Wining and dining options include a snack bar, pool bar (high season only) and a buffet restaurant. Available for a local charge are; parking, laundry service, souvenir shops and supermarkets (seasonal). Spread over several buildings of up to 3 floors, are one-bedroom apartments for up to 4 people and two-bedroom apartments for up to 6 people. Each apartment is provided with a full bathroom, balcony or terrace, living room with sofa bed and kitchenette with cooking rings, microwave and fridge. Apartments are air-conditioned (15/06 to 15/09), and equipped with a telephone and satellite TV. The hotel is situated right on the seafront, just 50m from the beach and within walking distance of the local shops, bars and restaurants. Mojacar town centre is around 3km from the complex. Decent hotel and you get what you pay for. Went on HB basis. Good choice of all hot and cold foods for breakfast. Dinners are usual self service with decent choice, but not great if you want restaurant style meals. We were able to swap dinner for lunch and that worked much better. Lower pool is very noisy and family orientated, upper pool quieter and nice long grass area in between which our room overlooked, so had 2 pool and garden view and also sea view beyond which was great. Room had also recently been refurbished with new kitchen and bathroom. Hotel well located for beach (across the road) and lots of restaurants etc. Staff are not fluent in English, but most fine and pleasant and room cleaned each day. Would recommend for a cheap week in the sun. Great location, opposite lovely beaches. Apartments very clean. Everything about it was fantastic. Thank you. Very roomy and clean apartments - it would have been far more comfortable around the pool if the sun loungers had cushions.